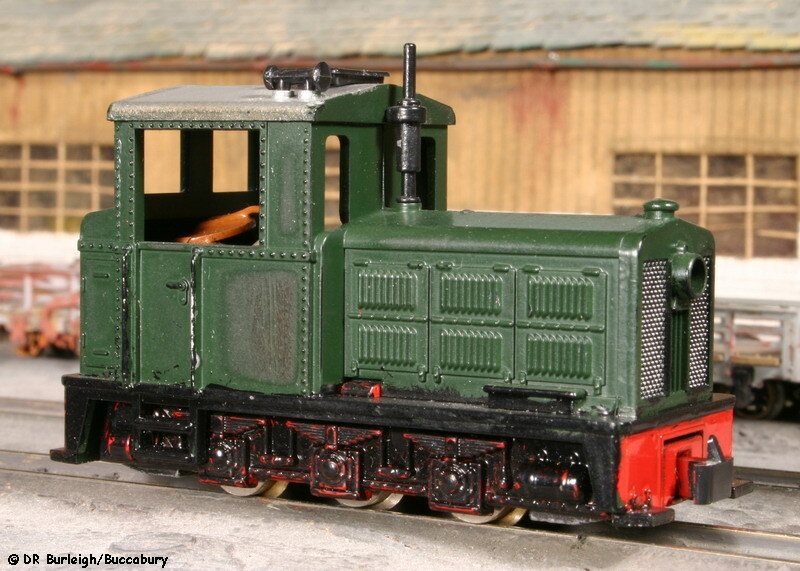 © DRB/Buccabury Standard Joueff Decauville 0-4-0 locos which pre-date the layout and which provided motive power on both my original 'OO' layout 'feeder' line and on the OO9 predecessor to the L&TR. 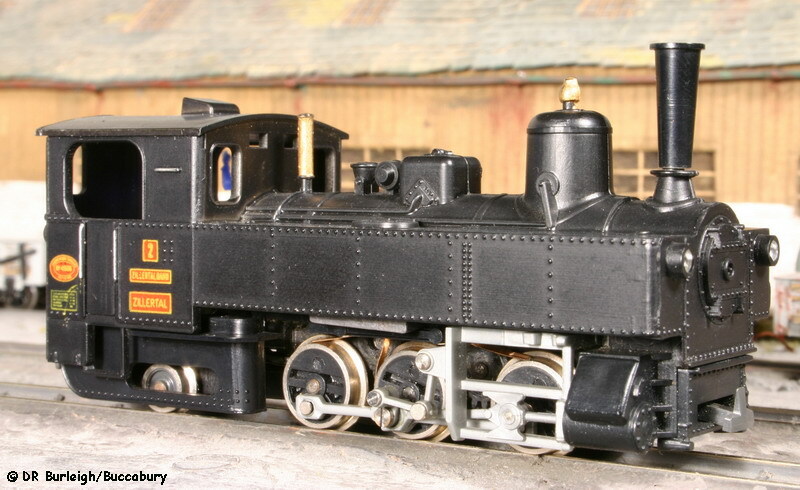 They have been fitted with numberplates and their numbers also appear on the front below the smokebox. Although out of regular service, they remain serviceable and are brought out for special occasions. 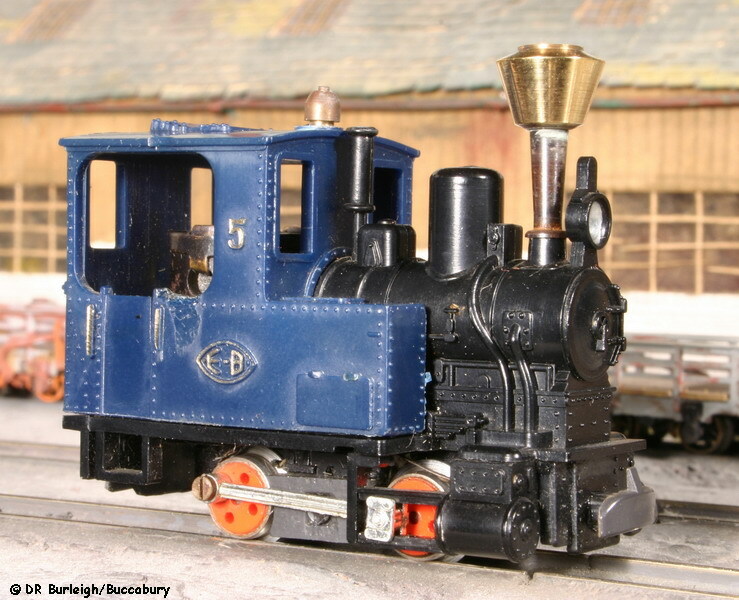 No.2 is shown as No.1 has lost its headlamp. © DRB/Buccabury Standard Egger-Bahn Western 0-4-0TT locos which were bought for service on the L&TR. 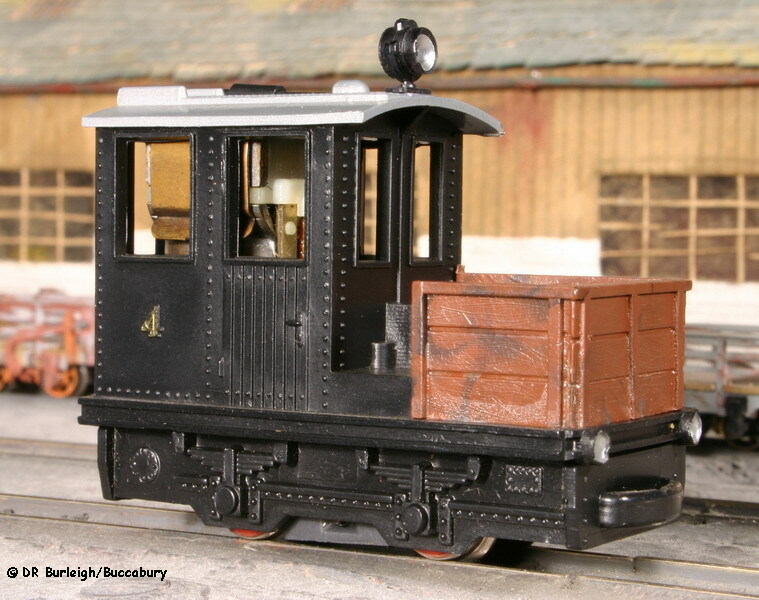 The lack of a front coupling meant that they spent most of their active life working the V tipper mineral trains which operated until the slate wagons appeared. Although serviceable, they now see very little use. © DRB/Buccabury Standard Egger-Bahn No.4 diesel. This was bought for the predecessor to the L&TR and spent its time hauling tipper wagons. It retains its original headlamp but the front coupling lost its pin, resulting in the loco's use on the V tipper mineral trains. 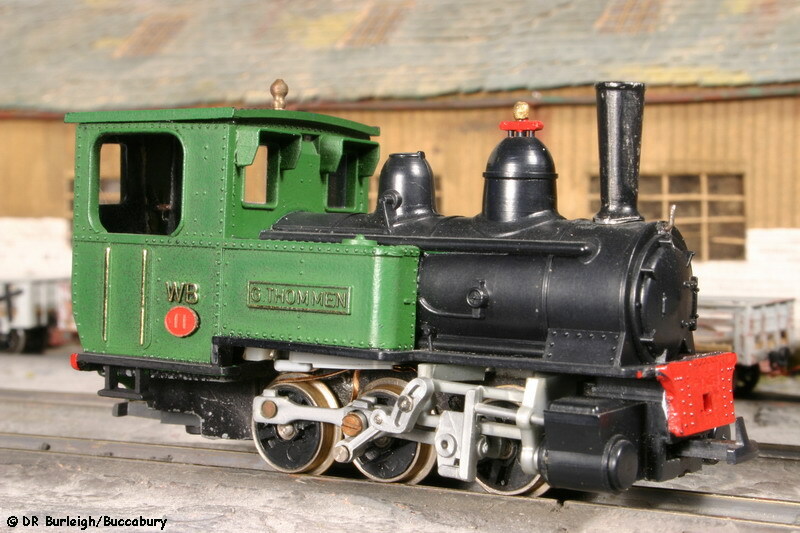 © DRB/Buccabury A GEM kit on an Arnold chassis, this was my first attempt at kit-building. 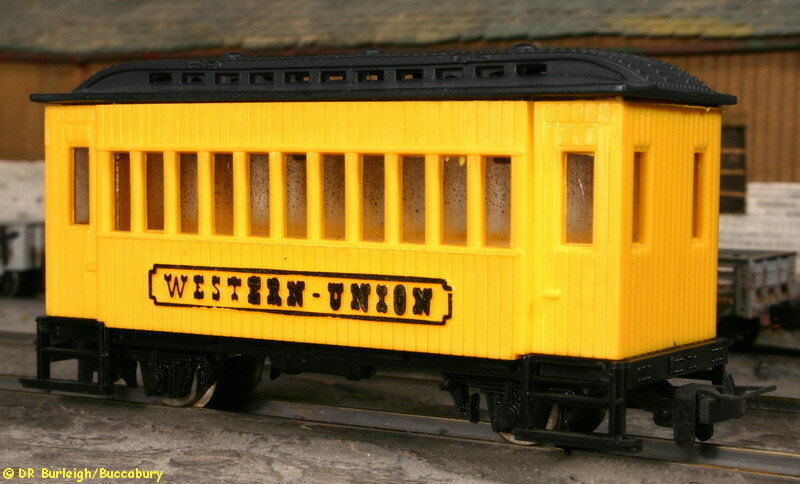 It suffered from but survived several nose-dives off the end of the unfinished layout but having been built with UHU glue was easy to repair! It eventually expired during an operating session on a blistering hot day in 1990, when the motor overheated, seized and melted the glue joints resulting in the sagging appearance! © DRB/Buccabury As soon as they became available, a pair of Roco Austro-Hungarian 0-6-0 tanks was bought to supplement the existing stock. 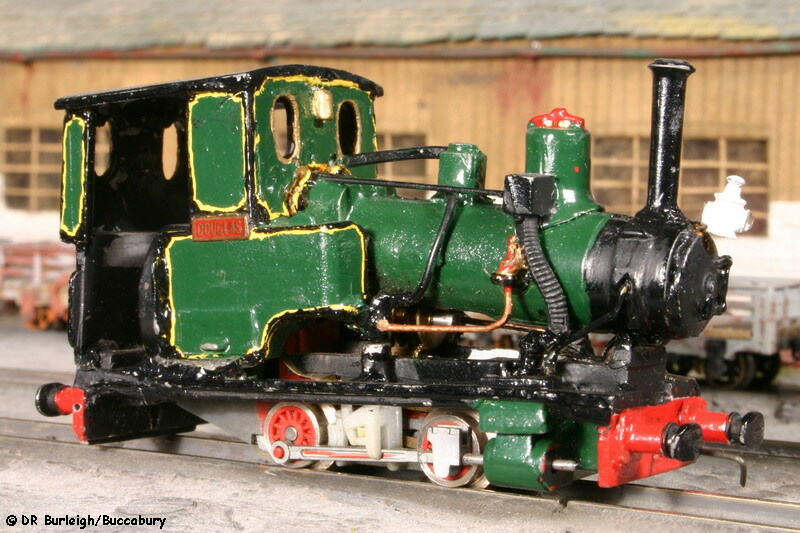 No.7 was given an Airfix 'pug' body and No.8 retained its original, which was repainted. 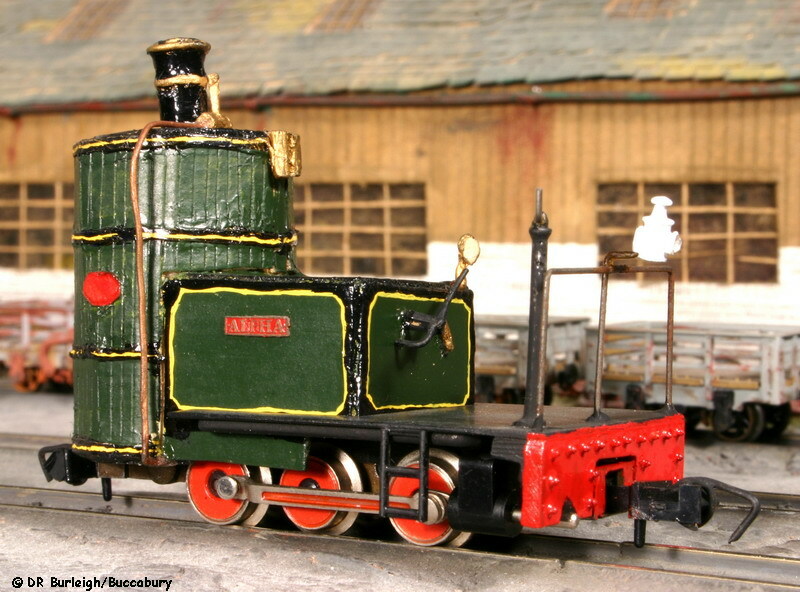 When No.7's chassis failed in 1987 the pug body was rebuilt and the chasses were swapped to keep the pug operational. © DRB/Buccabury I had a bit more money and at last could afford a Lilliput 0-6-2T which saw service until the kit-built fleet grew sufficiently. Still serviceable and now with additional weight, she occasionally sees operation on the railway. © DRB/Buccabury Some of these first generation Roco 6w diesels were excellent runners. Despite an eccentric wheel, this example did sterling service on works trains until 1988 when the motor finally expired. © DRB/Buccabury Bought at the Talyllyn Railway's model shop, this Lilliput 0-6-0T was a splendid runner and for many years the Railway's best performer with excellent slow-speed control. She needs some structural work to render her serviceable but mechanically is still a fine loco. © DRB/Buccabury I'd always wanted an Egger-Bahn 0-4-0 Austrian loco to match my rake of Egger Prussian coaches and this example turned up in 'Puffers'. My hopes for this loco faded as I realised that she just couldn't cope with the trains I was expecting her to haul. Serviceable but very rarely ventures past the museum doors. © DRB/Buccabury The origins of Alpha actually go back to about 1975 when I built a card mock-up of a vertical boilered loco to fit an Egger chassis. 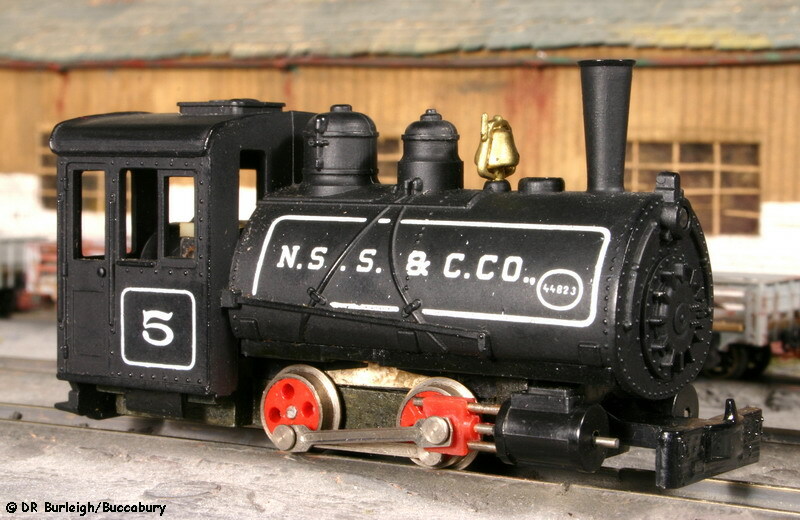 I then painted it for a better idea and it evolved into my first scratch-built loco! 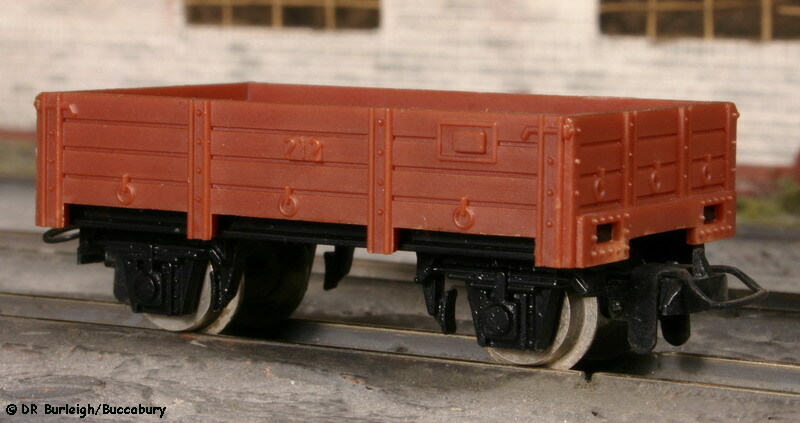 In 1980 I fitted it onto a Minitrix 0-6-0 dock tank chassis and added some ballast weight. Very serviceable but rarely used at present. 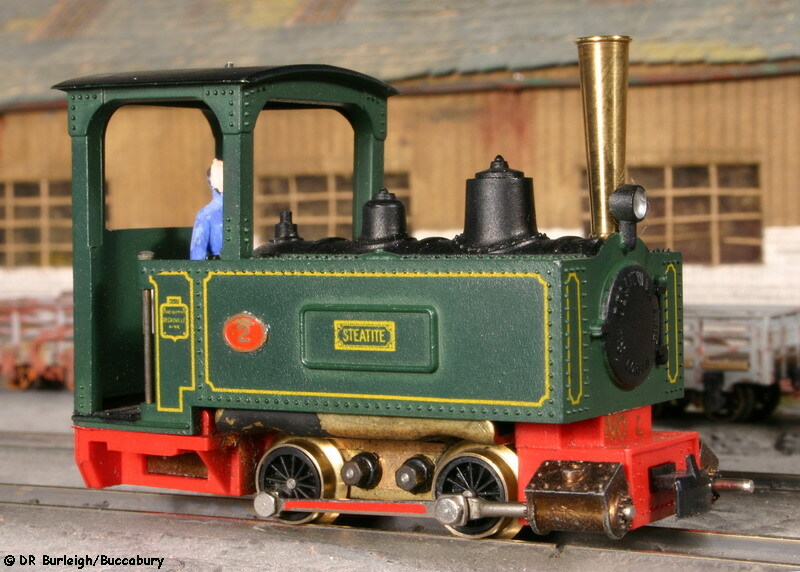 © DRB/Buccabury Another craving was satisfied when this Minitrains Baldwin 0-4-0 ST turned up on the 009 Society members' sales stand. Again very serviceable and with a working headlight but in deference to her age she only sees operation on special occasions or when I feel like it! 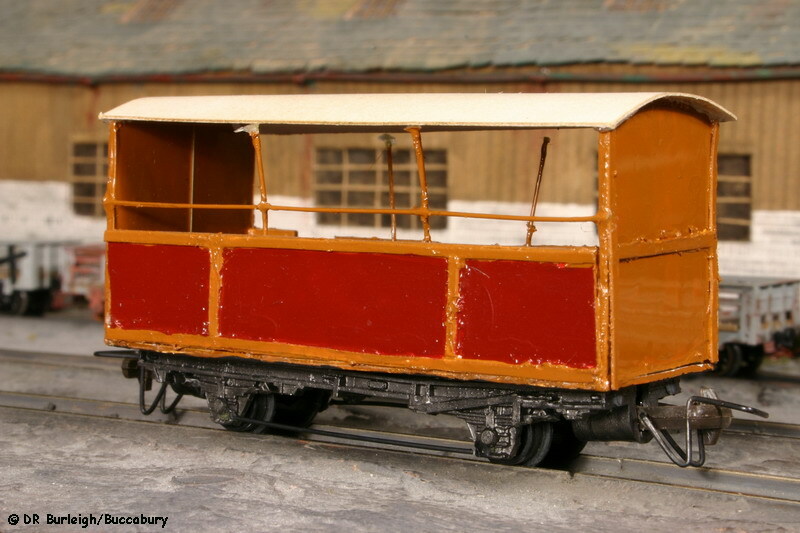 Before handbuilt rolling stock was in exclusive use, the railway relied heavily on the products of Egger-Bahn and Lilliput, which are now out of service in the museum. © DRB/Buccabury The first carriages were these Prussian clerestory coaches and are depicted here, not with the loco for which they were designed but with the original Decauville type with which they ran (and still do on special occasions). 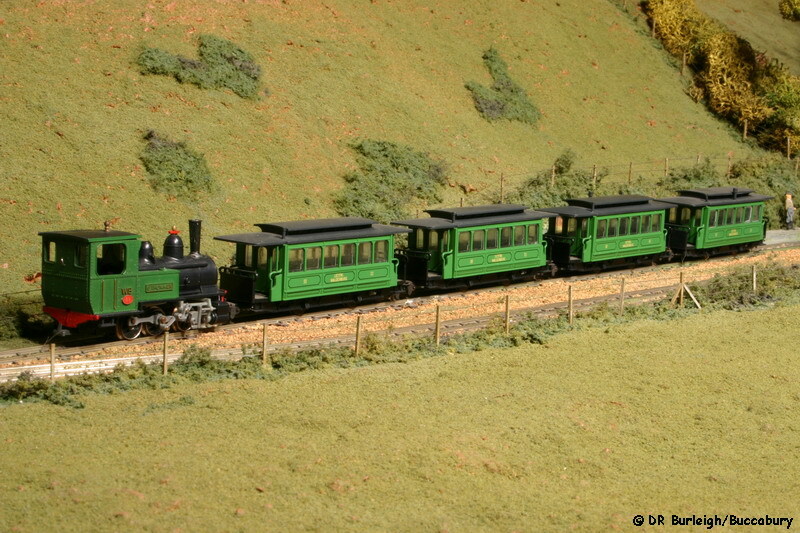 Like the locos, they saw service on the two previous lines before moving to the L&TR. 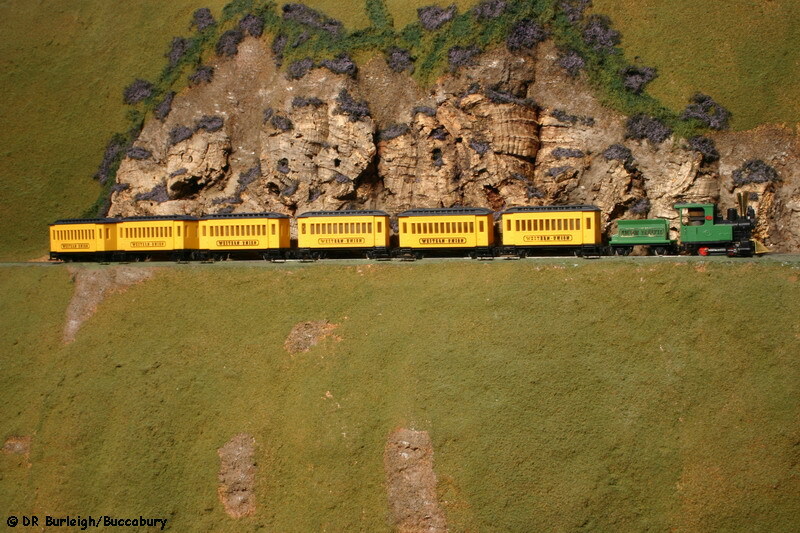 © DRB/Buccabury These were bought to accompany the two American locomotives and they look quite at home on the mountainside under Cefn Glas, where they have a slight hint of Durrango and Silverton helped by their bright yellow livery (which was probably inspired by the D&S). Bought to provide a third passenger set, they were never entirely satisfactory in service and didn't quite have the atmosphere of the Welsh narrow gauge for which I strived! © DRB/Buccabury One of these delightful vehicles was bought along with Loco No.11 and looked so good that three others were quickly ordered so that the Western Union coaches could be taken out of service. They saw extensive use until the railway's workshops finally came up with handbuilt rolling stock more in keeping with a Welsh valley. 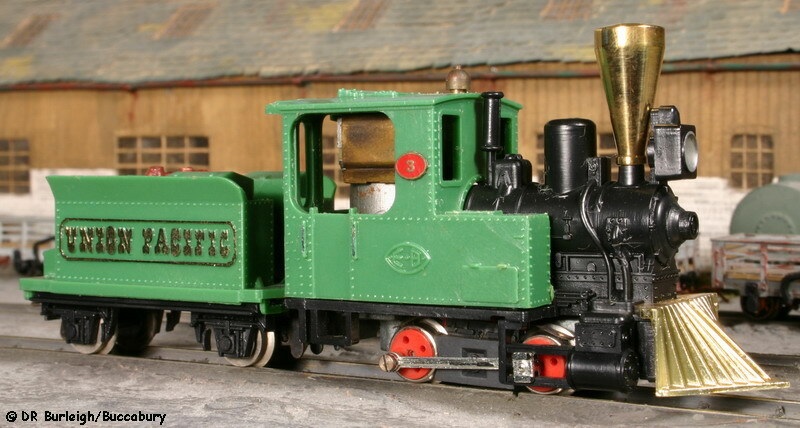 © DRB/Buccabury Built to run with the Talyllyn train, these two were my first ever attempt at scratch-building any rolling stock and were constructed mainly from photographic paper! 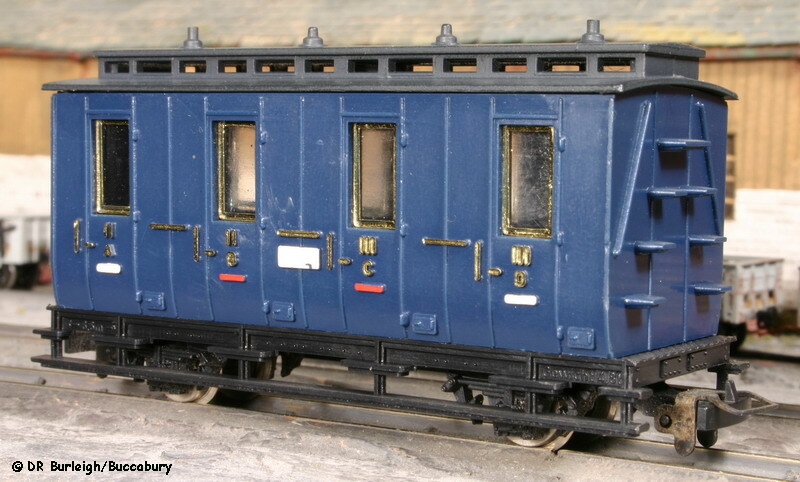 They were mounted on Peco 15ft �N� Gauge underframes but sadly I had no notion of ballasting then so they are far too light and have never run successfully in the set. © DRB/Buccabury Notice how the underframes have bent and the body of No 11 has started �hogging� in the fashion of many ancient cattle wagons! 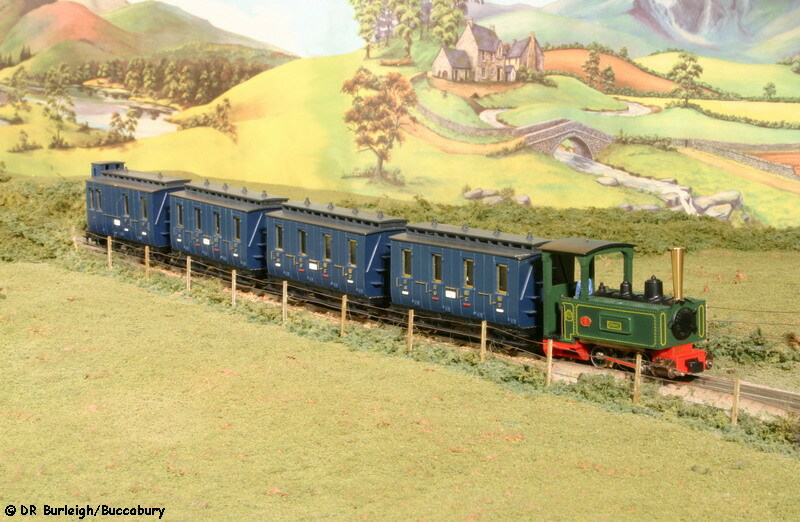 These vehicles provided the regular goods trains until handbuilt replacements became available and they could be retired to the museum. 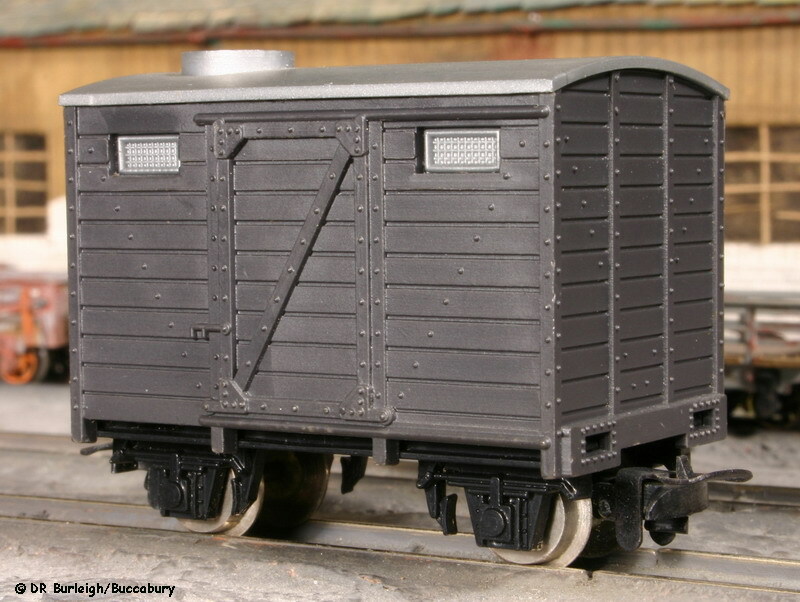 The short wheelbase vans and wagons provided a basis for the dimensions of the twelve goods vehicles now in regular service. The high quality of the original Egger-Bahn mouldings is evident. They all arrived on the railway in 1976. 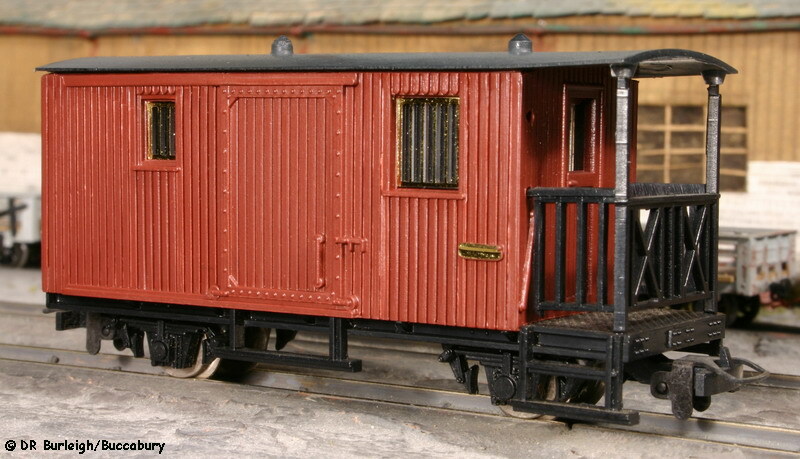 © DRB/Buccabury Two of these Egger brake vans were used extensively on goods trains until the railway's workshops built their replacements from Mikes Models coach parts. © DRB/Buccabury This Egger van saw use on goods trains until it was retired when the purpose-built replacements arrived. © DRB/Buccabury Three of these Egger vans were in use until replaced by the purpose-built rolling stock. 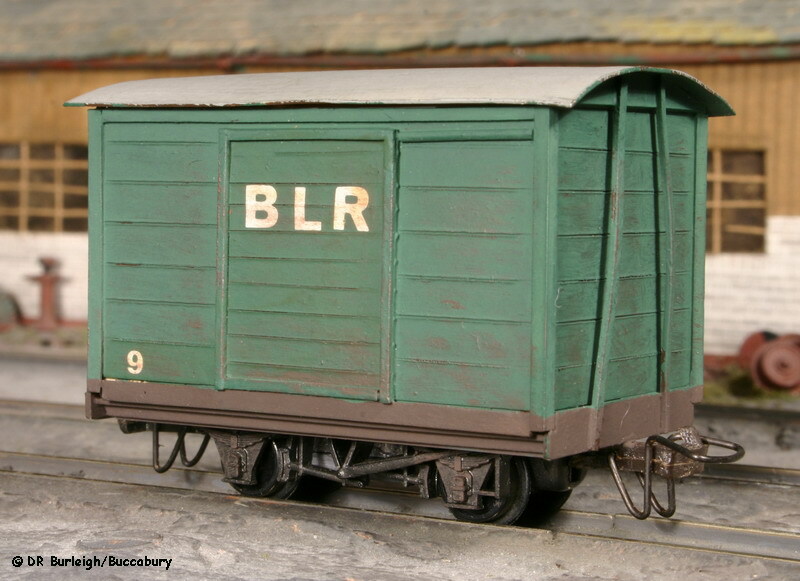 © DRB/Buccabury This Egger wagon saw service until its replacements arrived. © DRB/Buccabury Two of these Egger vehicles were used until the railway's new fleet of goods vehicles arrived. 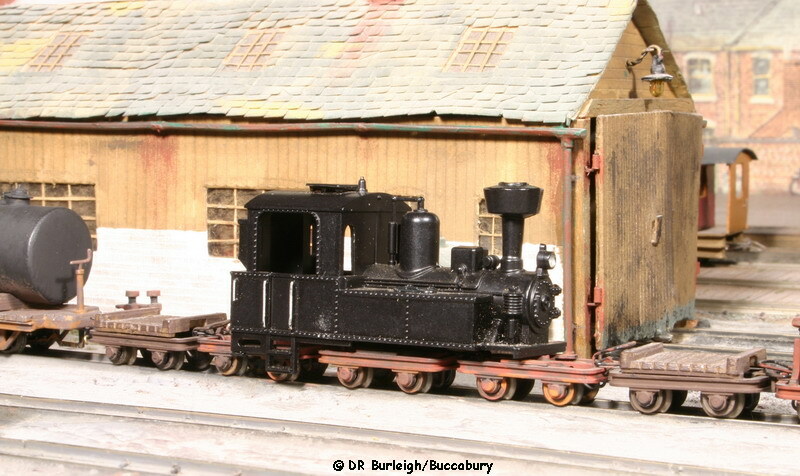 © DRB/Buccabury A bit of fun, built onto a well-wagon chassis given to me some years ago. 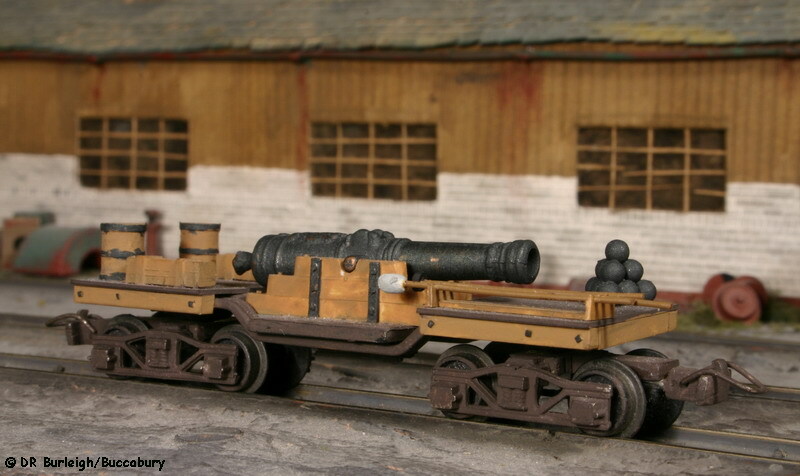 The muzzle came from a nautical modelling shop in Greenwich and the gun carriage and wagon floors were built up from styrene. It comes out for occasional use! © DRB/Buccabury Only one vehicle built for the railway has ever escaped. 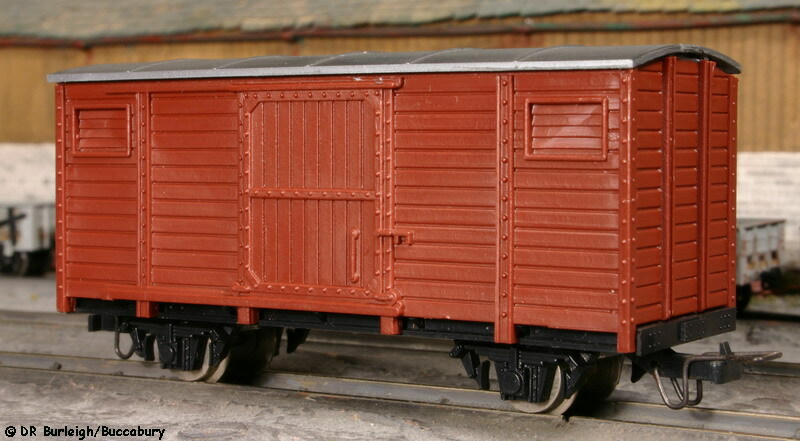 This was the first van, inspired by the Egger short wheelbase van and itself later helped to develop the main goods fleet which eventually led to its retirement. 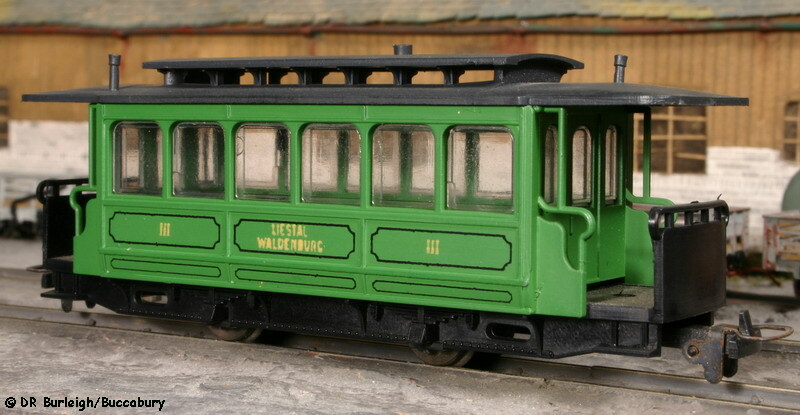 Originally painted brown, after being out of service for a number of years it was repainted for a new lease of life on the Buccabury Light Railway.